Home / TOP STORY/ UNP, SLFP unite for SAITM sanity! UNP, SLFP unite for SAITM sanity! The two parties of the coalition Government joined forces yesterday to address the SAITM crisis, with an impassioned appeal to students of State-run medical faculties to return to lectures, while proposing a course of action to address the demands made by student unions and the Government Medical Officers’ Association (GMOA). General Secretaries of the two parties reiterated the solutions given by President Maithripala Sirisena in his statement last Saturday following discussions with the GMOA. A separate Cabinet paper has been put forward by Minister of Health Rajitha Senaratne to take over the Neville Fernando Teaching Hospital attached to the college. 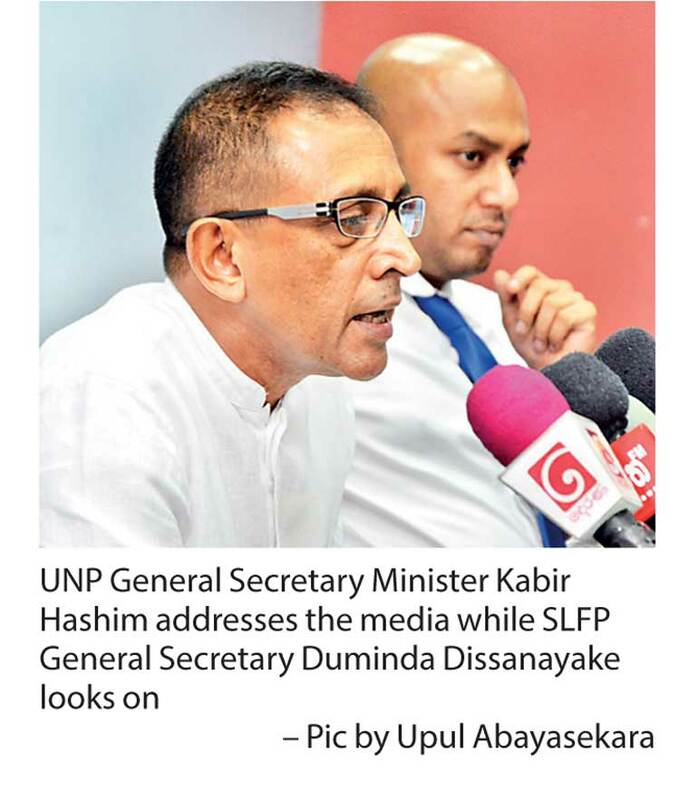 UNP General Secretary Minister Kabir Hashim told the media that the President would gazette the conditions the controversial medical faculty should meet. “Until they meet the conditions SAITM will not be allowed to admit new students or award degrees,” Hashim said while reading out the statement. The conditions to be imposed will be determined after discussions with all stakeholders, the Minister explained. As the minimum standards of medical education should be ensured under the law, the gazette regarding the minimum standards of medical education will be issued soon, he said adding that the impartiality of the Sri Lanka Medical Council (SLMC) will be guaranteed. Further, as per the statement made by the President, solutions will be sought to ensure that current courses of SAITM are up to a standard accepted by the SLMC and to bring the students who have completed the course up to a standard acceptable by the medical council. The fate of the private medical faculty will be determined following discussions with all stakeholders, the Minister said. “There are three options, it can be formed as a charitable institution with a council to run it, we can also look at forming a public-private partnership or there is also the option of listing 49% of the shares on the share market while the Government holds the majority of shares,” Hashim said. Minister Hashim, responding to the GMOA’s claim that the conditions outlined in the statement differed from the conditions agreed upon during the discussion, said that there is room for modification and improvement through future discussions. Highlighting that all individuals who break the law will be dealt with through the legal system, Hashim invited the medical students of the country to return to lectures without falling prey to the political agendas of external forces.